Conferences, workshops, forums Congratulations, advertisements. Focused on transfusiologists, clinical laboratory experts, intensivists, surgeons, obstetrician-gynecologist, cardiologists, oncologists and those professionals, involved in the promotion of blood donation and its components. The journal publishes previously unedited articles according to its profile. Articles representing separate stages of pending studies, as well as articles in violation of rules and regulations of humane treatment of study subjects are rejected for publication. All materials are submitted and reviewed by the editorial board. 2.1. The editorial board accepts the articles meeting the following requirements in print via e-mail info@transfusion-web.ru. The executive secretary of the publishing department in response necessarily notifies the author on the receipt of the article via e-mail. 2.2. The editorial board reserves the right to reject the works received not high enough score for reviewing, not meeting the profile of the journal. 2.3. Articles completed not by the rules are not accepted for publishing. 2.4. Peer review. All the articles received by the editorial board are necessarily reviewed. If the reviewer has any questions the article is returned for revision. The date of the article receipt is considered to be the date of the receipt of the final version of the article. The editorial board reserves the right to make editorial changes to the text not distorting the meaning of the article. 2.5. Payment. All scientific materials are published free of charge. The editorial board does not pay fees to the authors for their articles. 2.6. Personal copies of the journal. The editorial board sends 1 copy of the journal in which the article is published to the authors’ mail addresses. 2.7. Copyright to a particular article belongs to the author of the article. The publishing house is entitled to the design and publication of the journal. At reprint of the article or a part of it the reference to the journal is obligatory. 2.8. It is necessary to attach to the article the covering letter filled in accordance with the form and scanned. 2.9. The article size, including list of references, tables, figures, figure captions shall not exceed 20 А4 pages, review – no more than 15 pages. 2.10. Summary and keywords. Original articles must contain a summary and key words in Russian and English (Note - if necessary the editorial board assists authors with translations into English). The summary will contain authors' versions of their surnames in English. Summary – not more than 250 words. Shall reflect the subject of study (monitoring), the goal, methods, key results, field of their application and findings. This shall be followed by 7-10 key words. 2.11. Article structure: introduction, materials and methods, results, discussion, conclusion (outcomes). In features sections “Results” and “Discussions” may contain cross headings. A review article shall contain an analysis of the results of a study with an objective assessment. The publication of tables containing gross findings of the cited studies is allowed. 2.12. Article design. The text of the article should be provided in a format Microsoft Word, font - Times New Roman, font size - 12 items. Line interval - 1,5, margins - 2 cm from each side, format - А4 (210x297 mm). All pages of the manuscript shall be paginated in Arabic numerals at the top centre of the page. The text is typed on an entire page without hyphenation. While designing the text italics, boldface, sub- and superscripts, mathematical characters may be used. 2.13. Graphic requirements. Artwork (photographs, diagrams, schemes, figures e t.c.) shall be provided in TIFT extension, with resolution 300 DPI, figure size – no less 80x80 mm. Each graphic object shall be attached as a separate file with the name as a running number in accordance with its order in the article. A figure caption for each figure shall contain of its name and “legend” (explanation of the figure parts, symbols, arrows and other parts). It is necessary to specify the degree of magnification in microphotographs captures. At alphabetic designation only Cyrillic script and capital letters are used. 2.14. Table requirements. Tables shall be enumerated consequently and cited in the text. Every column shall have a short heading, omissions in lines (as for the lack of data) are indicated by a dash. For the data of other sources the link is needed. Duplication of the same information in the text, graphs and tables is unacceptable. 2.15. Acronym requirements. Acronyms should be limited by generally accepted standards (GOST 7.12-93 for Russian and GOST ГОСТ 7.11 -78 for foreign European languages), avoiding new, without reasonable grounds. It is allowed to use no more than 3-4 abbreviations, each of which must contain no more than three signs. Abbreviations stand for the first use of terms and remain constant through the text. Acronyms, abbreviations in tables are explained in a marginal. 2.16. Bibliographic references should be compared with the originals and brought by a cross heading “List of references” on a separate sheet. References to unpublished works are not allowed in the list of references. The references are indicated by a running number in square brackets. The references should be numbered strictly in the order mentioned in the text. All values given in the article should be expressed in SI units. 2.17. Bibliography (list of references) is printed on a separate sheet(s) with 1.5 line spacing, each source begins a paragraph with a running number. All works in the list are enumerated in the order of citation (references in the text), but not in an alphabetical order of the first authors’ surnames. When mentioning authors’ surnames in the text the initials shall precede them (foreign authors’ surnames are to be provided in the original transcription). The procedure for compiling a list is the following: а) author(s) of a book or an article; b) name of a book or an article; c) output. When the group of authors is up to 4 people inclusive, all the authors are mentioned (with initials after the surname), when the group of authors is large three first authors are mentioned and “et al.” is added. In some cases editors or compilers serve as authors of the books. After the surname of the last of them "Ed." should be put in brackets. A dot or a dash is put in the bibliographic description of a book (after its name), after that the city is mentioned where it is published, after a column – name of a publishing house, after a comma – the year of publication, after semi-column – a number of pages. If the reference is given to a chapter from the book the authors and the name of the chapter are mentioned first, after the dot – capital “In” is put: and author(s) surname(s) or an editor serving as an author, after that the name of the book and its output. In the bibliographic description of the article from the journal (after its name and sign //) catch-up title and the year of publishing are provided (between them a dot-and-dash is put), after the dot-and-dash - separated by a comma a part and an issue of the journal, after the dot-and-dash a number of the first and the last (in a dash) pages are placed. 1. Epifanov N.S., Zhuravlev V.A., Svedentsov E.P. 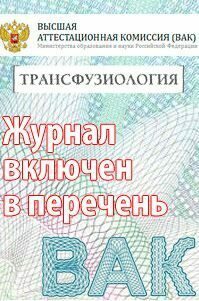 New types of donation.- Kirov: Volgo-Vyatskoe publishing house, Kirov department, 1987.- 95 p., gr. 2. Ness P., Braine H., King K. et al. Single-donor platelets reduce the risk of septic platelet transfusion reactions// Transfusion.- 2001.- Vol.41, №7.- P. 857-861. 3. Vergopulo А.А. Performance criteria to transfusiology maintenance of surgical service in multi-speciality hospital/Thesis ... Candidate of Medical Science.- M., 2009.- 200 p.
2.18. Advertising. The journal publishes advertising on its profile in the form of individual advertisements or articles containing business information on the profile of the journal (with the indication "Published as sponsored statement"). Advertising in the journal is fee paying. The amount of space for advertising information in the journal is limited. 3.1. The covering letter shall contain the name, title, position, place of employment and full contact details (postal address with a post code (office or home), contact phone number with a code, e-mail address (if applicable) of all authors. Also, one author from the group responsible for correspondence with the editorial board and work with proofs should be selected. The contact details of the author will be presented in the journal. 3.2. If the authors work in different institutions (cities), the covering letter may be submitted by each author. 3.3. If the sent article represents a study, contains the statistics or other data of the institution where the work was performed, the covering letter must contain a visa and a signature of the manager (specifying his surname, position, degree) certified by the seal of this institution (including its full name). 3.4. The covering letter shall be scanned and sent to the editorial board’s e-mail info@transfusion-web.ru.